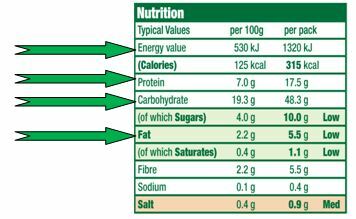 You may see a panel like this on the back of food packs.It tells you what nutrients are in the food. You can use this information to help you choose healthier food for your family. Manufacturers must by law include this information if they making a ‘nutrition claim’ about the product, e.g. is low fat or high in fibre. Many producers include this information voluntarily even if they have not made the nutrition claim. When nutritional information is given on a label, it must show the amount of each of the following nutrients in 100g or 100ml of the food, plus the amount of any nutrient for which a claim has been made. 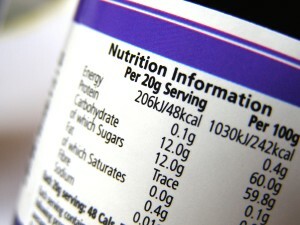 You will often find nutrition information on the Big 4 on nutrition labels. This is the amount of energy that the food will give you when you eat it. It is measured either in calories (kcal) or joules (kJ). Your body needs protein to grow, if you are still growing, and to repair itself. Protein-rich foods are meat, fish, milk and dairy foods, eggs, beans, lentils and nuts. Your body turns carbohydrate into energy. Simple carbohydrates, which include added sugars and natural sugars found in fruit and milk, are often listed on food labels as ‘carbohydrates (of which sugars)’. Complex carbohydrates are also called starchy foods. Starchy foods include bread, cereals, rice, pasta and potatoes. Try choosing wholegrain varieties whenever you can. You should get most of your energy from complex carbohydrates (or starchy foods) rather from sugars. Sometimes you will only see a total figure for carbohydrates on food labels. This includes the carbohydrates from starchy foods and from sugars which are simple carbohydrates. Many food labels give figures for the food’s fat content. 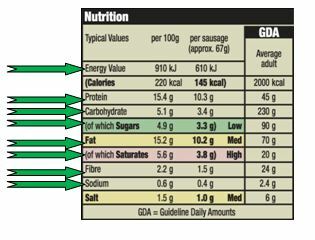 Some food labels also break the figures down into these different types of fat: saturates, monounsaturates and polyunsaturates. Saturated fat can raise blood cholesterol levels, which increases the chance of developing heart disease. Monounsaturates and polyunsaturates are both types of unsaturated fat. These don’t raise blood cholesterol in the same way as saturated fats and provide us with the essential fatty acids that the body needs. The following are all high in polyunsaturated fat: oil and spreads made from sunflower, rapeseed, and safflower. Other fats like olive oil are monounsaturated and these are also good for your heart. Many people don’t eat enough fibre. Fibre is a great nutrient, because we digest food that contains fibre more slowly. Fibre-rich foods can help make you feel full for longer, as well as improving what is often a subject that is not spoken about, bowel health. You should try to include a variety of fibre-rich foods in your diet. This is fibre that the body can’t digest, so it passes through the gut, helping other food and waste products move through the gut more easily. Insoluble fibre helps to keep our bowels healthy and stop constipation. And this means we are less likely to get common gut disorders. Wholegrain bread, brown rice, wholegrain breakfast cereals and fruit and vegetables all contain this type of fibre. This fibre can be digested and may help to reduce the amount of cholesterol in the blood. Good sources of soluble fibre include fruit, oats, and pulses such as beans and lentils. Phytonutrients, nutrients that help protect against cancers and heart disease, are also found in food that contains fibre, including fruit and vegetables. Eating more fruit and vegetables can only be positive. Eating too much salt can raise your blood pressure. People with high blood pressure are three times more likely to develop heart disease or have a stroke than people with normal blood pressure. Since three-quarters of the salt we eat comes from processed food – such as some breakfast cereals, soups, sauces, bread, biscuits and ready meals – it’s a good idea to check food labels so you can compare products and choose those with less salt in them.